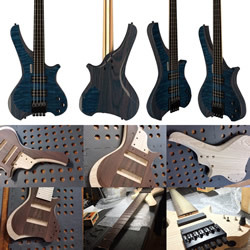 xen is the ongoing evolution of over 25 years of passion for guitar design. 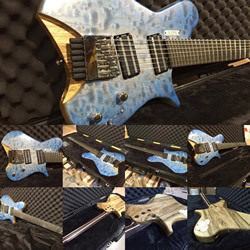 I have always strived to design guitars which enhance the connection between player and instrument; form and function working together to create a complete experience. It is my hope that my passion, inspiration, and commitment to excellence will help fuel yours as well. Why headless? Contrary to popular belief, it's not a passing fad. The first headless solidbody instruments, designed and built by Ned Steinberger, were produced over 37 years ago. Eliminating the weight of the headstock improves balance and comfort. Also, lessening the length of the strings past the nut prevents unwanted string vibration and harmonics. Tuning at the bridge is very simple and extremely precise. Try one! You may fall in love! Why the angled frets? A longer scale on the low end allows for more balanced tension from string to string. It requires little to no adjustment time, and can be more comfortable than stadard straight frets. 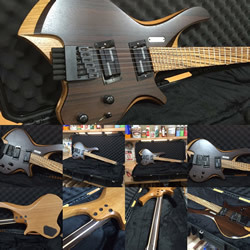 Why more than 6/4 strings? Simple. Some players need more range to be able to create their music. 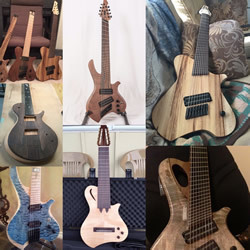 Guitars are available in 6-10 strings and basses in 4-9. This is an average for a standard spec build. Be aware that some options will drastically affect the timeline for delivery. 50% is due up front. It is not refundable once the build begins. The remaining 50%, plus s&h, is due upon completion. We also accept Square, escrow.com, and wire transfers. Please confirm method before sending any form of payment. DEFY CONVENTION. BREAK OUT OF THE MOLD. 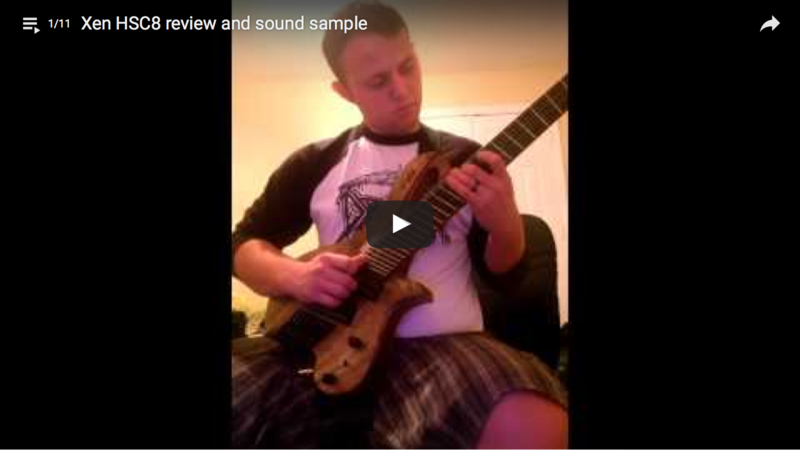 Check out XEN players showcasing their talents and instruments! If you know of any others that aren't on this playlist, please send them my way so I can add them! The more the merrier! I hope to add more demo videos soon. Stay tuned!